Azure Files is Microsoft's easy-to-use cloud file system. Azure file shares can be seamlessly used in Windows and Windows Server. This article discusses the considerations for using an Azure file share with Windows and Windows Server. In order to use an Azure file share outside of the Azure region it is hosted in, such as on-premises or in a different Azure region, the OS must support SMB 3.0. We always recommend taking the most recent KB for your version of Windows. Storage account name: To mount an Azure file share, you will need the name of the storage account. Storage account key: To mount an Azure file share, you will need the primary (or secondary) storage key. SAS keys are not currently supported for mounting. Ensure port 445 is open: The SMB protocol requires TCP port 445 to be open; connections will fail if port 445 is blocked. You can check to see if your firewall is blocking port 445 with the Test-NetConnection cmdlet. You can learn about various ways to workaround blocked port 445 here. The following PowerShell code assumes you have the Azure PowerShell module installed, see Install Azure PowerShell module for more information. Remember to replace <your-storage-account-name> and <your-resource-group-name> with the relevant names for your storage account. # The ComputerName, or host, is <storage-account>.file.core.windows.net for Azure Public Regions. # or Azure Stack deployments, will have different hosts for Azure file shares (and other storage resources). The above command returns the current IP address of the storage account. This IP address is not guaranteed to remain the same, and may change at any time. Do not hardcode this IP address into any scripts, or into a firewall configuration. To use an Azure file share with Windows, you must either mount it, which means assigning it a drive letter or mount point path, or access it via its UNC path. Unlike other SMB shares you may have interacted with, such as those hosted on a Windows Server, Linux Samba server, or NAS device, Azure file shares do not currently support Kerberos authentication with your Active Directory (AD) or Azure Active Directory (AAD) identity, although this is a feature we are working on. Instead, you must access your Azure file share with the storage account key for the storage account containing your Azure file share. A storage account key is an administrator key for a storage account, including administrator permissions to all files and folders within the file share you're accessing, and for all file shares and other storage resources (blobs, queues, tables, etc) contained within your storage account. If this is not sufficient for your workload, Azure File Sync may address the lack of Kerberos authentication and ACL support in the interim until AAD-based Kerberos authentication and ACL support is publicly available. A common pattern for lifting and shifting line-of-business (LOB) applications that expect an SMB file share to Azure is to use an Azure file share as an alternative for running a dedicated Windows file server in an Azure VM. One important consideration for successfully migrating a line-of-business application to use an Azure file share is that many line-of-business applications run under the context of a dedicated service account with limited system permissions rather than the VM's administrative account. 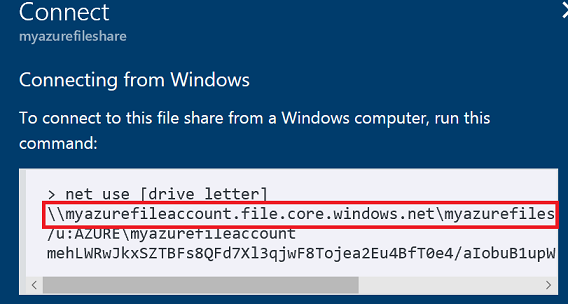 Therefore, you must ensure that you mount/save the credentials for the Azure file share from the context of the service account rather than your administrative account. The cmdkey utility allows you to store your storage account credentials within Windows. 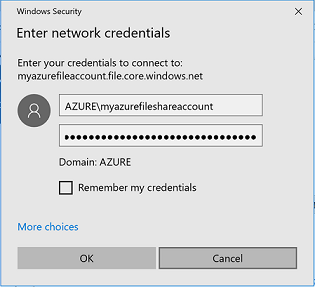 This means that when you try to access an Azure file share via its UNC path or mount the Azure file share, you will not need to specify credentials. To save your storage account's credentials, run the following PowerShell commands, replacing <your-storage-account-name> and <your-resource-group-name> where appropriate. # clouds or Azure Stack deployments, will have different hosts for Azure file shares (and other storage resources). You should now be able to mount or access the share without having to supply additional credentials. There are two additional scenarios to consider with cmdkey: storing credentials for another user on the machine, such as a service account, and storing credentials on a remote machine with PowerShell remoting. This will open a new PowerShell window under the user context of your service account (or user account). You can then use the cmdkey utility as described above. Storing the credentials on a remote machine using PowerShell remoting is not however possible, as cmdkey does not allow access, even for additions, to its credential store when the user is logged in via PowerShell remoting. We recommend logging into the machine with Remote Desktop. Run the following commands from a regular (i.e. not an elevated) PowerShell session to mount the Azure file share. Remember to replace <your-resource-group-name>, <your-storage-account-name>, <your-file-share-name>, and <desired-drive-letter> with the proper information. # hosts for Azure file shares (and other storage resources). Using the -Persist option on the New-PSDrive cmdlet will only allow the file share to be remounted on boot if the credentials are saved. You can save the credentials using the cmdkey as previously described. If desired, you can dismount the Azure file share using the following PowerShell cmdlet. Note that the following instructions are shown on Windows 10 and may differ slightly on older releases. Open File Explorer. This can be done by opening from the Start Menu, or by pressing Win+E shortcut. Navigate to the This PC item on the left-hand side of the window. This will change the menus available in the ribbon. 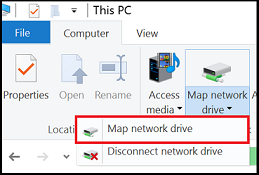 Under the Computer menu, select Map network drive. Copy the UNC path from the Connect pane in the Azure portal. Select the drive letter and enter the UNC path. Use the storage account name prepended with AZURE\ as the username and a storage account key as the password. Use Azure file share as desired. 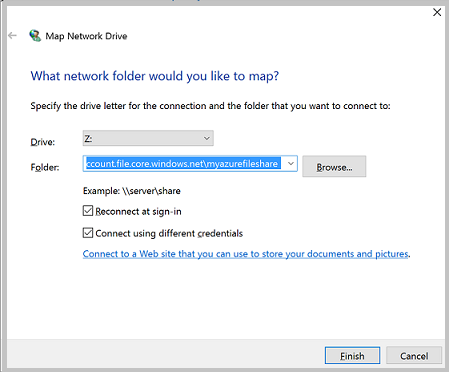 When you are ready to dismount the Azure file share, you can do so by right-clicking on the entry for the share under the Network locations in File Explorer and selecting Disconnect. 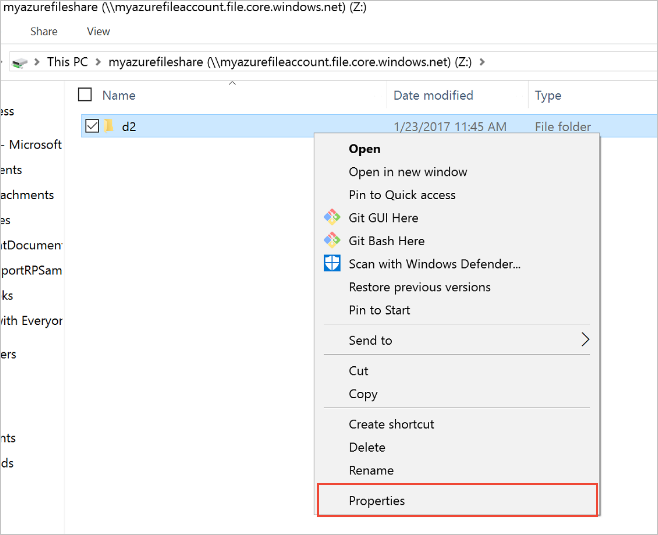 If you have taken a share snapshot, either manually or automatically through a script or service like Azure Backup, you can view previous versions of a share, a directory, or a particular file from file share on Windows. You can take a share snapshot from the Azure Portal, Azure PowerShell, and Azure CLI. Browse to the item or parent item that needs to be restored. Double-click to go to the desired directory. Right-click and select Properties from the menu. Select Previous Versions to see the list of share snapshots for this directory. The list might take a few seconds to load, depending on the network speed and the number of share snapshots in the directory. You can select Open to open a particular snapshot. 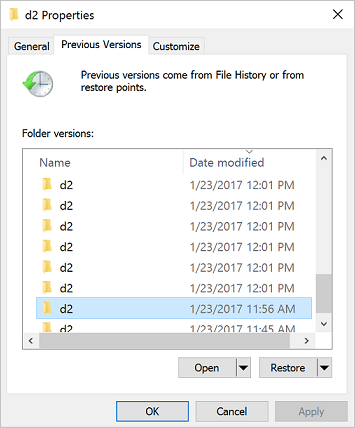 Select Restore to copy the contents of the entire directory recursively at the share snapshot creation time to the original location. In order to mount an Azure file share on Windows, port 445 must be accessible. Many organizations block port 445 because of the security risks inherent with SMB 1. SMB 1, also known as CIFS (Common Internet File System), is a legacy file system protocol included with Windows and Windows Server. SMB 1 is an outdated, inefficient, and most importantly insecure protocol. The good news is that Azure Files does not support SMB 1, and all supported versions of Windows and Windows Server make it possible to remove or disable SMB 1. We always strongly recommend removing or disabling the SMB 1 client and server in Windows before using Azure file shares in production. Before removing SMB 1 in your environment, you may wish to audit SMB 1 usage to see if any clients will be broken by the change. If any requests are made against SMB shares with SMB 1, an audit event will be logged in the event log under Applications and Services Logs > Microsoft > Windows > SMBServer > Audit. To enable auditing support on Windows Server 2012 R2 and Windows 8.1, install at least KB4022720. To complete the removal process, restart your server. Starting with Windows 10 and Windows Server version 1709, SMB 1 is not installed by default and has separate Windows features for the SMB 1 client and SMB 1 server. We always recommend leaving both the SMB 1 server (FS-SMB1-SERVER) and the SMB 1 client (FS-SMB1-CLIENT) uninstalled. To complete the removal process, restart your PC. 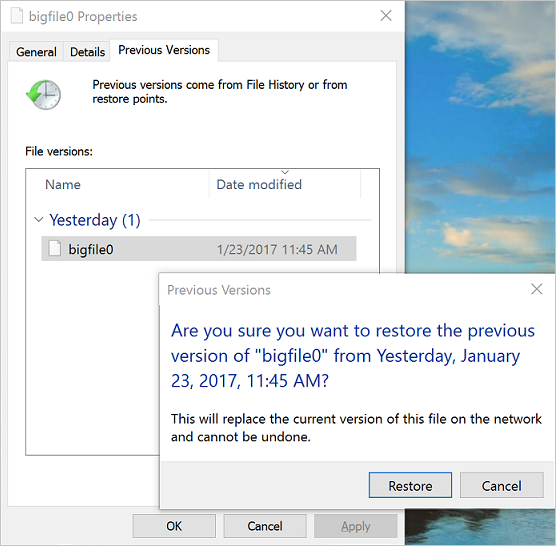 SMB 1 cannot be completely removed on legacy versions of Windows/Windows Server, but it can be disabled through the Registry. To disable SMB 1, create a new registry key SMB1 of type DWORD with a value of 0 under HKEY_LOCAL_MACHINE > SYSTEM > CurrentControlSet > Services > LanmanServer > Parameters. After creating this registry key, you must restart your server to disable SMB 1.